Truffles are hard to resist decadent treats and for a chocolate freak like me its impossible to stop myself from indulging in this rich temptation. They make for a perfect gift and are super easy to make with just two ingredients ~ chocolate and heavy cream. There are numerous ways by which you can flavor the truffles -alchohol, orange zest/citrus peel, cayenne chili, cinnamon and expresso being some of them. 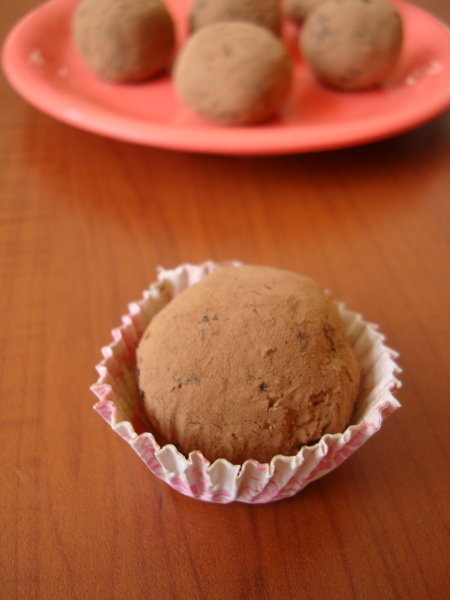 This is a basic chocolate truffle recipe and one cannot go wrong with it. Bitter sweet chocolate works best but I used both milk chocolate and dark chocolate. The key is to use good quality ingredients. These have a melt in the mouth texture and the next time I make them I will coat them with tempered chocolate. Nehal can finish 2 to 3 truffles in one go and loves them plain without any adornment. Truffles are best when served at room temperature. 1 Heat a pan, add butter and fresh cream. Bring to a boil (as bubbles appear along the edges of the vessel) turn off heat. 2 Place chopped chocolate in a stainless steel vessel. Pour the cream over grated chocolate and let it stand for 3 mts. Use a whisk to gently stir till smooth. (Do not beat). Bring to room temperature. 3 Cover the stainless steel vessel with a cling wrap and place in the refrigerator. Allow to set till firm for 4 hours or overnight. 4 Place a little cocoa powder or desiccated coconut or icing sugar or chopped nuts like pistachios/almonds in a plate. 5 Remove the cling wrap off the stainless steel vessel, use a melon scoop or spoon to remove the chocolate and make small balls. 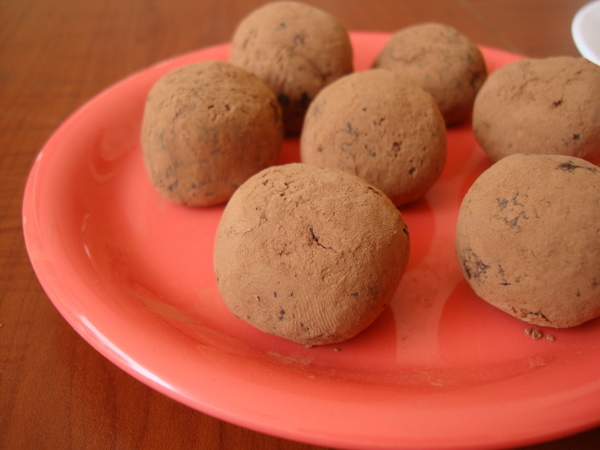 Dust your hands with cocoa powder while rolling the balls so that they do not stick to your hands. 6 Roll the truffles in the coating of your choice. 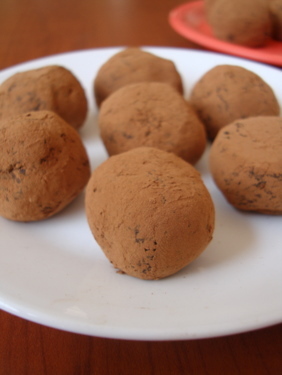 Shake truffles in a sieve to eliminate excess cocoa if using cocoa to dust. Place them on parchment/butter paper lined plate, cover and refrigerate the truffles. 7 At the time of serving bring them to room temperature. Store in an air tight container in the fridge. Thanks for the super easy recipe. Will try and let you know how they turn out ! Feel like gobbing some,tempting truffles. This makes a great holiday treat.. so beautifully done..
sailu… next time try rolling in a molten choclate…. the difference is that since u added cream to the base truffle… the coating should be tempered choclate… i.e just regular milk choclate that is just about melted preferably in a microwave…it shoudlnt be too hot otherwise the truffle itself will melt when u roll it in the second layer… the difference in hardness of the two choclates gives a completely different feel to the truffle… the outer layer u can add nuts.. to give it a feel similar to ferrero rocher!! Yes, Suchitra, completely agree with you on the ferrero rocher feel. 🙂 . I have done that too. In fact I have mentioned that the next time I make them I will coat with tempered chocolate and hopefully blog about them. Store bought fresh cream like Amul works best. 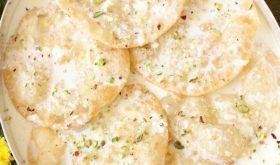 Malai or top of milk will not work. nice yummy recipe, have lots of whipping cream sitting in the refrigerator. What is the shelf life of truffles and can they be freezed for later consumption? Hi Sailus Thanks for the recipe, I tried ur recipe, but I was unable to make rolls, the chocolate started melting in my palms itself. The heat of the palm will melt the chocolate. 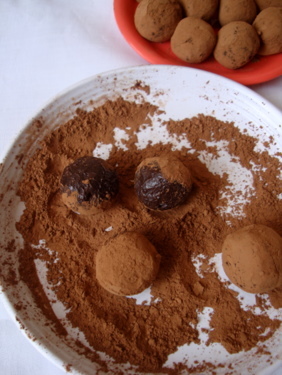 Dust your hands with cocoa powder and take the chocolate from the fridge and then make balls. Place back in fridge for some more time if the chocolate needs to set till firm. 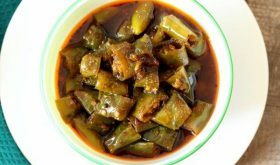 Hi Sailu, An amazing recipe…. 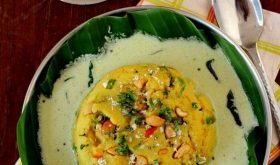 Its Easter today & i tried this recipe for the first time. Turned out very yummy!!!! My little girl simply loved it…. The comment is unrelated to the above recipe, love your blog, and worried your http://www.sailusfood.com/copyright_disclaimer/ link isn’t working! Only 20 min? Usually I spend about an hour for preparing and cooking truffles. Chocolate is my all time favorite flavor, I was just thinking of something different. At last I found what I was looking for. 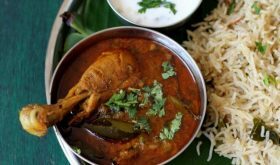 Wow its looks very delicious. Wait nahi ho raha hai yaar bus koi dede khane ke liye. Can we use some other chocolate apart from Morde? Can a normal Amul/dairy milk work instead? hi mam. divya here again. 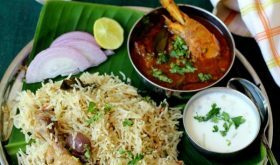 i tried ur mutton biriyani with the corrections u told me. came out very well. then tried ur chicken manchurian, mutton korma, bread halwa. everything came out well. my hubby is singing my praises. now want to try this chocolate truffle 4 my daughter. but here in chennai i cannot find the morde variety. wat else can i substitute mam??? just one question, how many pieces will it make? at the beginning u wrote 20, thn at the end, 10!.. I m planning to make it in a large quantity, so I want to clarify.